The Home of the Pendle Witches where log fires and a warm welcome awaits. We offer good, honest Lancashire pub food, fine local ales and en suite holiday cottages to rest your tired legs. We source all of our food from only Lancashire farms and dairies and our real ales are famous around the area. The rooms at the Inn are set in an annex just meters from the pub with parking and private access provided. Based on two levels with your private bathroom, lounge and mini kitchen on the ground floor and your super king bed on the first floor. Click below for more information. The Inn itself is at the heart of the village serving 6 real ales and is often the meeting point for many groups. We serve food and drinks from 12 pm daily, with meals to suit every appetite, from homemade pies to hand cut steaks from the local farm. Click below for more information. 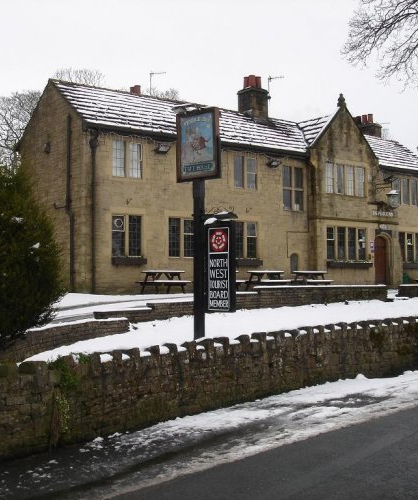 The Pendle Inn is a well established country watering hole for many walkers, cyclists, groups and families who have enjoyed the local area and all it has to offer. We are set in The Forest of Bowland but only 5 miles from the neighbouring towns of Burnley and Clitheroe. The Home of the Pendle Witches where Log fires and a warm welcome awaits. The Pendle Inn is a well established country watering hole for many walkers, cyclists, groups and families who have enjoyed the local area and all it has to offer. We are set in The Forest of Bowland but only 5 miles from the neighbouring towns of Burnley and Clitheroe. The village of Barley has great facilities for those with outdoors at mind and plenty for the children to keep them entertained with special sculpture walks, parks and ice creams the little ones will go home happy! The Inn itself is at the heart of the village serving 6 real ales and is often the meeting point for many groups. We serve food and drinks from 12 pm daily, with meals to suit every appetite, from homemade pies to hand cut steaks from the local farm.